Riding a snowmobile or wheeled vehicle can be fun and exciting for the whole family. Take a class, join a club, and ride responsibly. The New Hampshire Fish and Game Department strongly recommends that all riders participate in a Safety Education Class. State law requires that all operators 12 years of age and over must possess either a valid Motor Vehicle Driver’s License or must have successfully completed an approved OHRV or Snowmobile Safety Education Class when operating off their own property. Classes are free and offered throughout the state. For class schedules or more information on these requirements, contact Fish and Game at 603-271-3129 or visit ride.nh.gov. OHRV education classes are offered online, as well as in the classroom. The online course costs $29.50. Traditional classroom courses are free. Register for online classes and find a schedule of traditional classes, at ride.nh.gov. OHRV Safety Instructors: Each year, OHRV Regional Coordinators assist more than 150 volunteer OHRV safety instructors, who in turn educate some 1,000 students in snowmobile, ATV and trail bike safety. Regional OHRV Coordinators include Timothy Acerno, Bryan Hadlock, Marie Hixson, and Craig Mayo. 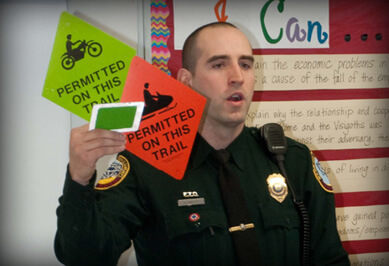 “We strongly recommend that all riders who purchase or rent OHRVs or snowmobiles take a safety class to help reduce the risk of personal injury and property damage,” said Captain Dave Walsh, who coordinates OHRV safety education and enforcement for the N.H. Fish and Game Department. Help Teach OHRV and Snowmobile Education! If you are an experienced OHRV or snowmobile enthusiast, consider joining the ranks of more than 150 volunteers who are certified instructors for the OHRV and Snowmobile Education program. Riding knowledge is helpful, of course, but just as important are enthusiasm and a willingness to learn. You’ll enjoy the camaraderie of fellow instructors! For more information, call (603) 271-3129. Though all ice is potentially dangerous, the U.S. Army Cold Regions Research & Engineering Laboratory in Hanover, N.H., offers a “rule of thumb” on ice thickness: There should be a minimum of six inches of hard ice before individual foot travel, and eight to ten inches of hard ice for snowmachine or All-Terrain Vehicle travel. Be aware that ice can be weakened by objects frozen into it, because they hold the heat from the sun; avoid docks, large rocks and trees fallen onto the ice. Also avoid areas with springs or moving water under the ice.